Born in 1966 in Rui’an, Wenzhou, Zhejiang Province, Chi Lingyun is an increasingly important Chinese poet who began writing in 1985 and has worked as a teacher, journalist, and editor. Her poetry collections include Darting Snow (1997); Solitary Dialogue (2005); Selected Poems (2010); and Muted Light (2013). Her work has been translated into German, English, Korean, Russian, and other languages. The 2010 recipient of October magazine’s Poetry Award, she has also presented her art at Hankuk University’s Kim Dal Jin Literature Festival in South Korea. The US literary journal Chinese Literature Today also featured and reviewed her work in 2014. She currently lives in Wenzhou, south of Shanghai on the China coast. Notable for its sudden yet tonally harmonic obliquities, Chi Lingyun’s poetry joins her sense of nature as redemptive and instructive to a distinctly expressionist imagery. Distrustful of appearances, she is nonetheless finely attuned to their resonance, delving to deeper regions of mind and identity, especially where fusion with our surround achieves transformation. In the heat of this exchange, the intensity of the present often melds with sharp or shadowed images from the buried past, releasing an elemental energy. Anastassis Vistonitis was born in Komotini, Northern Greece, in 1952. He studied Political Science and Economics in Athens, and Philosophy in Thessaloniki. From 1983 to 1988 he lived in the US and traveled extensively across Europe, North and South America, Africa, Australia, and Asia. 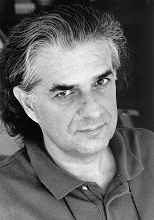 From 1996 to 2001 he served on the board of The Federation of European Writers, and from 2003 to 2008 as its vice-president. He was the General Editor of Athens’ candidature file for the 2004 Olympic Games, and is the founder and former vice-president of Poets’ Circle. Author of eleven books of poetry, four essay collections, five travelogues, and a volume of short stories, he has also edited and translated The Daemon in the Mirror, fifty poems by the Chinese classical poet Li He (Li Ho). His many book reviews, cultural essays, individual travelogues, and myriad articles have appeared in leading quarterlies and newspapers in Greece and abroad. His work has been rendered into more than twenty languages, and included in numerous anthologies. Notable among English translations of his poetry is the volume Mara’s Shade, Selected Poems, Tebot Bach 2011. A German collection of his Selected Poems, Wellen des Schwarzen Meeres, (Waves of the Black Sea) appeared in 2001. He writes for the leading Greek newspaper To Vima and lives in Athens and Ljubljana. Anastassis Vistonitis’ poetry is rooted in profound familiarity with current and classical literature, Greek and Mediterranean myth, political and philosophical thought and history, as well as the particular agonies of modern Europe and Greece. Though his imagery achieves moments of splendid and joyous transcendence, these are sometimes set against ruined and desolate landscapes no less common to our own era than to those which precede it. Unique among contemporary poets, his voice weaves gorgeous metaphor with chill prophecy and dark remembrance. Chung Kwok-keung (Derek Chung) was born and raised in Hong Kong, and graduated from Hong Kong University’s Faculty of Arts. His honors include two successive 1st Prizes in the Hong Kong Youth Literature Poetry Awards; The Hong Kong Public Library Award for Creative Writing in Chinese; and the Hong Kong Arts Development Council’s Annual Literary Artist Prize. Among his poetry collections are Encircled; Scenery on the Road; Doors and Windows, Wind and Rain (winner of the 6th Hong Kong Biennial Award for Chinese Literature’s Selection Prize in Poetry); Adrift in the City (the 7th Hong Kong Biennial Award for Chinese Literature’s Selection Prize in Poetry); Growing House (1st Prize in Poetry from the 8th Hong Kong Biennial Awards for Chinese Literature ); On the Ordinary (1st Prize in Poetry from the 12th Hong Kong Biennial Awards for Chinese Literature); and Umbrellas Blooming in the Streets. His prose includes the essay collections Two Cities; The Tree of Memory; Words at First Sight; the short story collection Sometimes Forgetful; and Floating Thoughts, a volume of literary criticism. Share the post "Winter 2016-17"